As the sweltering summer approaches, students and teachers start rejoicing in the anticipation of the imminent vacations. At least the scorching sun brings good news for someone! With schools and colleges closed, you have a good opportunity to travel with your family to a place that has little to do with constantly rising temperature and is free from many constrains of city life. Most of us head out to a hill station with our families and I Eat, Pray and Sleep by the words that the one thing that knits a beautiful bond between the family members is when they are out travelling together. Here I have prepared a list of not-to-miss places for those who haven’t yet decided where to go on a summer vacation in India with family. A Kashmiri lady, who lives in the same building that I live in, once over a cup of tea said something that urged me to go and visit Kashmir. She said “go to Kashmir, not because several brochures, websites and magazines tell you to, but because you should!” I have never seen beauty so divine and perfect anywhere, but in Kashmir. The amiable people and the heartwarming hospitality add to the charm of the valley. So, what to see in Kashmir?? Well, you have four great destinations for spending holidays in Kashmir; the first is Pahalgam, second is Gulmarg, third is Sonmarg and fourth is Srinagar. Pahalgam is a perfect destination for families looking to spend some leisure time; there are many hotels and resorts in Pahalgam that offer great value for money. If you have kids older than 8 years, you can go river rafting in Lidder River or skiing in Aru Valley. Angling and leisure walks are other activities you can try out to when in Kashmir. Gulmarg couldn’t charm you more! Set amidst lofty snow-clad mountains, Gulmarg offers holidayers the time of their life. A major attraction in Gulmarg is the cable car ride to and from Kongdoori and Apparwath Peak. The view from the top is breathtaking! Though, Sonmarg is a bit of an offbeat destination for families, yet it has lot of interesting things to offer. Camping, tent-staystrekking –to Thajiwas Glacier, fishing, and strolls along the lake side stroll are some of the things you can do in Sonmarg. Our fourth destination Srinagar is amongst the best places to go on a summer holiday with family in India. Besides being the state capital, Srinagar is also the cash cow of Jammu & Kashmir tourism. Shikara ride, houseboat stay and water-skiing (if your kids are minimum 12 years of age) are some activities that can be enjoyed with family in Srinagar. For sightseeing, you can go to Mughal Gardens namely, Chashma-e-Shahi, Shalimar Bagh and Nishat Garden, Hazratbal Shrine and Hari Parbat Fort. Ladakh is beautiful, unique and incredible! It is something that you have never seen before! A perfect holiday destination in the state of Jammu & Kashmir…BUT I would only recommend a family holiday here to people who think they can handle the moody weather and have older kids. As beautiful as this place is, it is equally rigorous and challenging. 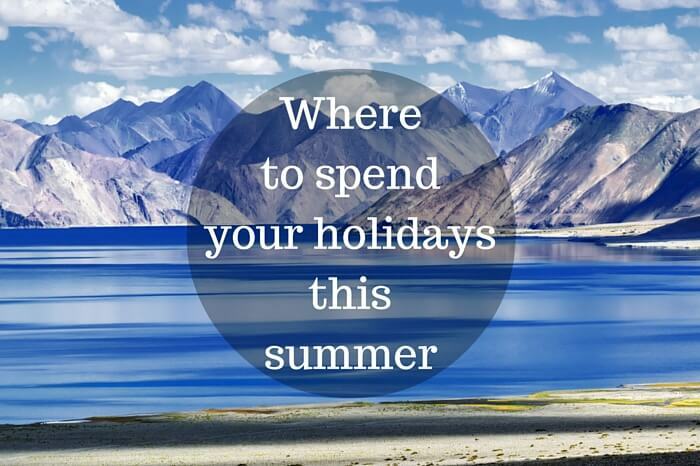 The best places to visit in Ladakh with family are Leh and regions. The reasons being, first, it is easy to reach Leh, as there is air services to Leh from Delhi and Jammu. Secondly, during the summer season, the mercury remains steady at 30 degree Celsius, making it quiet a pleasant time to visit. You would like to visit the 800 year old Kali Mandir, perched on top of a mountain; the Shanti Stupa situated right outside the city; and the 17th century Leh Palace. Thiksey and Hemis monasteries are other prime attractions of Leh. If your health allows and your kids get well acclimatized , you can head out of Leh city and visit the beautiful Pangong Lake, Tso Moriri Lake and Nubra Valley. Needless to mention that Manali is exceptionally beautiful! Adding grace to the abundant beauty of Himachal Pradesh is the Manali hill station, one of the most visited tourist destinations in India. I remember my first trip to Manali and how I fell in love with the place. The snow-covered mountains, the evening scarlet sky and the picture perfect Rohtang Pass, these images kept tugging at my heartstrings and reminding me about Manali for a very long time. The perfect settings also make Manali a perfect honeymoon destination. Hadimba Temple, Solang Valley, Vashisht Village, Naggar, Rahala Falls and Rohtang Pass are some popular sightseeing places in Manali. Shimla is an ideal destination to spend your summer holiday in India. It offers one of those home away from home experiences and draws attention of families who are looking for a comfortable, leisurely stay amidst picturesque surroundings. The reason I would pick Shimla as a family holiday destination is the fact that the climate is bearable in summers (neither too hot nor too cold), there are several avenues for dining (all cuisine are available), plentiful shopping and accommodation options, and the low-traffic. There is calming peace everywhere just does the trick for you! Linger around the Mall Road, eat, shop and visit the beautiful church located on the Ridge near the mall. Take out time for visiting Jakhu Temple, which is perched on top of a hill and has a huge statue of Hanuman. Kali Bari Temple is another attraction in Shimla; this temple is situated in the heart of the city and can be visited while going towards the Mall Road. Don’t forget to get a family photo done in the traditional attire! It might look stupid at that time but will make a great story later. The mighty Dhauladhar does the magic for Dharamshala! A quiet valley that is overlooked by lofty snow-clad mountains, Dharamshala wears the costume of beauty and invites travel enthusiasts to experience the marvels of nature. I clearly remember the summers of May 2011, when my friends decided to buy tickets for a cricket match between Delhi Dare Devils and Kings XI Punjab. Dharamshala came to life as a scene from a movie. There I stood speechless in the HPCA stadium! Cricketers looked like ants crawling on the grass from where I was seated, but the view of the surroundings is all that I remember. The lofty conical mountains were simply breathtaking. I enjoyed every bit of my stay in Dharamshala, a calm and composed hill station that allows a perfect holiday especially with family. Kangra Art museum at Kotwali bazar, War memorial, Kunal Pathri temple and tea gardens on the way to Kunal Pathri are places that can be visited in Dharamshala. Inarguably one of the most popular summer destinations in India, Darjeeling is dubbed as ‘Queen of the Hills’. The modern day Darjeeling is a busy hub and may I put it humbly, a bit congested. However, the charm of this beautiful destination still remains young. One can trudge to Tiger Hill peak early in the morning to witness of the best sunrises in India. The Toy Train ride is something that can be enjoyed with the entire family. The train runs between New Jalpaiguri and Darjeeling, offering the 70 kms stretch filled with sheer fun. Rock Gardens and the waterfall are in close proximity and are worth visiting. A ride on the Darjeeling-Rangit passenger cable car or the ropeway is a thrilling experience for the tourists. Like other hill stations in India, Darjeeling also has many ideal places for tourists to eat, stroll, and shop: The Mall Road or Chowrasta is one famous name that immediately comes to mind. Ghoom Monastery, Dali Monastery, Tamang Ghumba and Aloobari Monastery in Darjeeling can also be visited with family. The Ava Art Gallery, Japanese Peace Pagoda, Batasia Loop and the War Memorial, Botanical Garden, Scrubbery Park, Red Panda Breeding Farm, Himalayan Zoo and Dhirdham Temple are other attractions in Darjeeling. It is often seen that people tend to overlook the North East while planning a summer holiday in India, although this part of the country has some of the best summer destinations in India. One of the most beautiful northeastern states is Sikkim; this second smallest state in the country has lots to offer to its visitors. There are number of destinations that can be picked for an ideal summer holidays in India: Pelling, Ravangla and Gangtok are some of the best places to travel with family in North East. Situated in the West district of Sikkim, Pelling is a top family vacation in India. The breathtaking Mt. Khangchendzonga is what appeals the tourists the most here. One can visit Pemayangste monastery, Sanga Choling monastery, rock garden at Rimbi, double-pronged Kanchenjungha Falls, Singshore Bridge, the Chhange Waterfalls and the Khechuperi Lake here. Kayaking, rafting and trekking options are other activities that add excitement in a family vacation in Pelling. Another summer destination in the North East from Sikkim’s bag is Ravangla. Located in the southern district of Sikkim, Ravangla is a small yet picturesque town. Admired for its natural beauty, Ravangla offers a view of lofty peaks of Mt. Kanchenjunga, Mt. Pandim, Mt. Sinialchu and Mt. Kabru. The Ralong Monastery here is known for producing the best hand-woven carpets in India. One must also make time to visit the Rayong sunrise view point in Ravangla. Undoubtedly one of the most beautiful places in India, Gangtok is the perfect holiday destination for a family. An urban destination of Sikkim, Gangtok promises all kinds of amenities to tourists. A chilled out destination, it has many places where you can take up recreational activities. Walk up to the forests, sit on the benches in the Titanic park, savour the taste of some delightful cuisine and stroll on the MG Marg. The natural beauty encounters you everywhere that you go in Gangtok. Situated at an elevation of 2000 m, Mussoorie has always been a popular tourist destination in India. Green rolling hills and varied flora makes it no less than a fairyland. Mussoorie becomes quite crowded in the summers, so it is better to book hotels in advance. While enjoying the ride on the ropeway or the cable car, which takes you to Gun Hill, catch the fantastic panoramic view of Mussoorie. The Mall Road is quite the charmer as this place allows tourists to shop for various gifts items to take with them for their family members and friends. Another fun place to visit in Mussoorie is Kempty Falls, where one can enjoy bathing under a giant waterfall to one’s heart’s content. Other than these Cloud End and Lal Tibba are some must visits in Mussoorie. When I was in school, summers used to be the best time! My friends and I would go for a stroll along the Mall Road in Nainital in the evening as a religious routine… Evening used to be the rush hour, when most of the tourists in Nainital thronged both the upper and the lower Mall Road. Being locals, we guys would put on our best clothes to look like a tourist… Crazy days those were! Don’t know about the tourists but the evening sky, the gleaming lights around the lake and the bustling of cheerful crowd made our day… Nainital is a small hill station, which is situated at an altitude of approximately 1,938 m above sea level. The centrally located lake is a major attraction in Nainital; boating is something that is enjoyed greatly by tourists here. There are many places to see around Nainital like Saattal, Bheemtal, Naukuchiyatal and Khurpatal. Naina Devi Temple, Tibetan Market, Snow View, Tiffin Top and China Peak are must see in Nainital. Situated at a distance of about 63 kms from Nainital, Ranikhet is a quiet and picturesque hill station in North India. An ideal destination for a laidback holiday experience right in the lap of nature, Ranikhet rejuvenates and makes the experience of travelling with family more special. Chaubatia Garden is an orchard, sprawling over an area of about 265 acres. Mamkhameshwar Temple, Tarikhet, Syalikhet and Bhalu Dam are popular places in Ranikhet that one can visit with family. Trekking in Ranikhet is also an option; if you have older kids you can trudge from Gagas to Dwarahat. As it is a calm and quiet place, you will enjoy your long leisure walks in the nearby forest areas. Also, one can enjoy the traditional Kumaoni delight in many of the restaurants situated in the market area here. Neatly tucked in the northern part of West Bengal, Kalimpong is a piece of diamond. The ‘picture perfect’ factor of Kalimpong has made it a popular summer vacations destination in India. The assimilation of different cultures has made this destination quiet colourful while the scenic landscape has enhanced the grace of the place. Expect a peaceful stay against the backdrop of the lofty Mt. Khangchendzonga and other rolling hills. You can take up trekking in order to multiply the fun of your family holiday or simply go sightseeing and on a exploration tour of Kalimpong. Samthar is a good destination to trek; it is situated at an elevation of 4,500 ft and the trekking trail passes through rich forest area that offers bird watching opportunity as well. Dr. Graham’s School, Rissisum, Lava and Jhandidara are other notable places to see in Kalimpong. Another gem from the pocket of Uttarakhand, Almora is well known for its unique cultural heritage, fascinating handicraft, succulent cuisine, and rich flora and fauna. Wrapped with greenery and graced by River Kosi, Chittai Temple and beautiful sunrise and sunset of Bright End Corner, Almora is indeed a gift to nature lovers. The mix of quaint and urban setting with the lofty mountains as a backdromakes it an ideal summer holiday destination. Visit Kasar Devi, Martola, Katarmal Sun Temple and Baijnath Temple for an exhilarating experience. A short walk from Almora city is Simtola, which is an ideal picnic spot; the alignment of pine and deodar trees make this place quiet picturesque. Almora is also the perfect destination for spending a family holiday because it offers every family member equal opportunity to enjoy. Once the summer capital of Bombay Presidency, Mahabaleshwar is now one of the most popular hill stations in Maharashtra. Nestled in the Western Ghats, this beautiful destination offers pleasant climate all year round. Besides being an ideal summer resort, it is also a thriving honeymoon destination in the country. Mahabaleshwar is blessed with verdant greenery and a tranquil ambiance that allows perfect vacations with family. There are sights like Arthur’s Seat, Needle Hole Point, Kate’s Point, Wilson’s Point and 3 Monkey Point that can be good places to visit in Mahabaleshwar. The Venna Lake is a major attraction for tourists. Do not forget to try strawberry, raspberry and mulberry with cream that are popular here. Away from the hustle and bustle of city life, Pachmari in Madhya Pradesh offers respite from the sweltering summers. It is the only hill station in Madhya Pradesh and is replete with colonial charm. At Pachmarhi, nature is the way of life! Trekking and leisure walks are activities that you can enjoy along with sightseeing. Reechgarh, Bada Mahadeo, Pandav Caves, Padmini Lake, Priyadarshini Point and Apsara Vihar places that one can visit with family. Boating in Padmini Lake is a major attraction in Pachmarhi. The crown of Nilgiri district, Ooty is just about it! As a queen of hill stations in South India, this destination is known to provide tourists with ample of options to look forward to. The resplendent landscape and the soothing climate make it one of the most popular hill stations in South India. The Western Ghats has been kind enough to provide Ooty with just the right type of ambiance and beauty, if you are on the go with your family in Ooty, do not miss out on places like Botanical Garden, Lake Park, Deer Park, Doddabetta, Kalhatty Falls and Pykara Lake and Waterfalls. You can enjoy playing snooker and golf along with activities like fishing, trekking and horse racing in Ooty. The charming city of Kodaikanal is another great destination for summer vacation in India with family. Here, you and your family can enjoy spending time together exploring the city. Recline in the lap of nature and enjoy the surrounding beauty. The Lake is a major attraction in Kodaikanal along with Bryant’s park, Solar Physical observatory and the Pillar Rock. The Kurinji Andavar Temple, Telescope House, Green Valley View, Thalaiyar Falls and Kukkal Caves are other important places to visit in Kodaikanal. The city has a pleasing environment that keeps visitors relaxed; a family holiday here can prove to be completely rejuvenating. One good thing about the hill stations of South India is that they have a different pace than the rest of India: their movements are more harmonious with nature are therefore more soothing. Along with a laidback holiday, visitors have the chance to explore the culture, tradition and history of the place. Wayanad is blended perfectly with culture and nature and reflects a pleasing picture. Lush green surroundings, delightful weather and picturesque landscape make Wayanad a place to be at! To most of us who travel to a hill station from plains, the change in landscape can be astonishing. We sigh with pleasant surprise at the sight of clouds which look so different and alive in these parts of the country or the lofty mountains. Here, at Wayanad, which is located about 76 kms away from the shore of Kozhikode in Kerala, we can expect a similar breathtaking experience. A great place to dodge the summers, Wayanad offers you and your family a soothing and relaxing vacation. Pookot Lake, Thirunelly Temple, Edakkal Caves, Pakshipathalam and Pazhassi Raja Tomb are the major tourist attractions. Dotted with many waterfalls like Sentinel Rocks Waterfalls, Kanthanpara Waterfalls and Soochippara Waterfalls, Wayanad is a great place to find relief from the smoldering summers. The fresh mountain air and the clear blue sky… a powerful combination that makes your excursion in Shillong remarkable! The beauty of the North East never fails to impress travel enthusiasts. Situated in the East Khasi Hills, Shillong is one of the most easily accessible cities in North East India. Adorned with pristine natural settings and a fine mixture of culture and tradition, it is one of the best places for vacations with family. Relax and rejuvenate your senses and get lost in the cheerful ambiance here. You can visit Lady Hydari Park, Ward’s Lake, Spread Eagle Falls, Sweet Falls and many other places and attractions around Shillong like Elephant Falls, Sohpetbneng Peak, Jakrem, Ranikor and Dawki. A summer holiday spent in Munnar, Kerala, is a holiday well spent. Sprawling tea gardens, lush green rolling hills and the salubrious climate does the magic for Munnar. Enjoy a pleasant holiday experience with family in Munnar; visit Pothamadu, where a sprawling land of tea, coffee and cardamom welcomes you. The Sita Devi Lake in Devikulam offers an ideal family picnic spot and opportunity to enjoy trout fishing. Attukal and Nyayamakad are other places that one must visit in Munnar. Long walks and trekking are two good ways of exploring Munnar better. If hustle and bustle of the city is what you want to avoid for a couple of days, then Coonoor in Tamil Nadu is the place for you. The place in mystical manner understands the need for people to get some peace of mind. Far from the constantly rising mercury and unavoidable traffic of cities in India, Coonoor warmly welcomes its visitors and offers them serene ambiance and scenic beauty to set their eye upon. Lush greenery and impeccable landscape certainly pacify the anxieties of the visitors and also offer them opportunity to relax their senses. Located at a short distance -about 17 kms– from Ooty, Coonoor offers a rare sight of ‘Kurinji’ flowers… but that happens only once in 12 years. Other than this unmatched sight, one can enjoy witnessing the beauty of Coonoor at Lambs Rock, St Catherine Falls, Lady Canning’s Seat, Sim’s Park, Dolphin’s Nose, Law’s Falls, Ralliah Dam and Droog. Well, summer vacation with family can be exhilarating; there is no better time to spend a quality time with each other than these short yet magical vacations. Make most of these summer vacations by planning an interesting escape to any of the above suggested hill station in India.